The Ebola crises in West Africa, is still making headlines and, with cases having been reported in countries outside of the main area of infection, people around the world are beginning to ask; could Ebola spread? According to the World Health Organisation, the total number of recorded infections of the Ebola virus has reached 30,000 and the total number of Ebola deaths is currently in the region of 11,000 people. The strict controls that have now been put in place by most Western countries mean that a world-wide outbreak of Ebola is unlikely, but there are still cases being reported of people returning home from West Africa, carrying the virus. Here are the answers to the questions about Ebola that most people ask. 1. What countries currently have an outbreak of Ebola? The current outbreak of Ebola is in West Africa, primarily in the countries of Sierra Leone, Liberia and Guinea. There have also been approximately twenty cases to date reported in Nigeria and a small number of cases of Ebola infection have been reported in the UK, USA, Mali and Spain. Outside of West Africa, cases of Ebola have so far been restricted to visitors to West Africa returning home. 2. Is Ebola always a fatal disease? World Health Organisation statistics show that 50% of all known cases of Ebola have been fatal. 3. Is there a drug available to treat Ebola? There is currently no approved drug on the market for the treatment Ebola. There is a drug called ZMapp, which id an anti-body based drug, but that has yet to undergo all the human testing that it needs to. It was used to treat to treat two American health workers who had contracted the Ebola virus. 4. Is there a vaccine to protect people against the Ebola virus? Potential vaccines have been tested on animals and the signs have been promising. However, testing on human beings is problematic, because of the very nature of the disease and the dangers involved. Potential vaccines are, however, being tested for safety on people who have already contracted the Ebola virus. 5. What are the main symptoms of Ebola? Victims of the Ebola virus can feel weak, develop a fever, get a sore throat and suffer muscular pain. In the later stages of Ebola infection, patients can also suffer from bleeding internally and bleeding externally. 6. How is Ebola contracted? Ebola is passed on to human beings from animals, or other infected human beings, via bodily fluids or blood. It can be picked up by coming into contact with a carrier of the Ebola virus directly, or it can be picked from the environment around an Ebola victim, such as towels and clothing. It can also be picked up by having contact with the dead body of someone who has died from Ebola. 7. How long does Ebola take to incubate in a human? It can take as long as three weeks for an infected human being to show any signs of having contracted the Ebola virus. The virus is also very hard to detect and this is why it has been possible that some health workers and aid workers returning from West Africa do have the virus but, it isn’t detected straight away. 8. What can you do to protect yourself from Ebola? Currently, the Ebola outbreak is restricted to West Africa, so people living in other regions need do no more than follow normal sensible precautions such as washing their hands regularly. In areas of the Ebola outbreak, though, health workers working with victims of the virus wear full protective clothing, gloves masks and goggles to avoid contracting the disease. 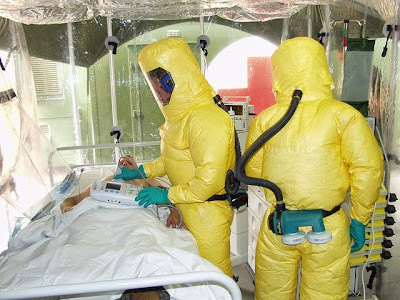 Ebola is a frightening disease, especially when you see health workers wearing full protective gear and respirators like those in the image above. A full scale world side pandemic is unlikely, though, especially now that governments around the world have stepped their screening procedures for people returning from the region of the current outbreak of Ebola. It does, however, make you think that, maybe, one day, there will be indeed be a virulent virus that sweeps around the world and takes its toll on us all.